Get a Brighter, whiter smile in just 15 minutes! At Healing Laser Clinics Spa your smile is important. It’ one of things people notice when they meet you. A brighter, whiter smile can help you feel better about yourself and leave a lasting impression. Our teeth whitening system is affordable and the experience is in a relaxed environment. Whether it’s coffee, tobacco, red wine or just the effects of time that have stained your teeth, Healing laser Clinics Spa professional teeth whitening system will give you a beaming white smile in minutes. With Beaming White™ teeth whitening you will have a smile you can be proud of! Much more effective – The gel has a 16% hydrogen peroxide concentration (the highest concentration in the market for cosmetic teeth whitening). In a tray type system, the highest you can safely use is 12% hydrogen peroxide. 16% in a mouth tray can trigger a lot of gum irritation. 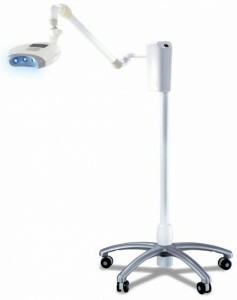 There is no mouth tray interfering between your teeth and the LED light. Even if the mouth tray is clear, it can still refract light. It is much safer because gel is applied directly to your teeth so nothing squeezes onto your gums – it does NOT cause gum irritation even with 16% H2O2. It is very comfortable because the cheek retractor keeps the client’s mouth open without any effort on their part. With the tray system, the customer strains to keep smiling and it can be difficult and cause pain. Many people can not expose their teeth totally to the light when they smile, so the results are uneven. 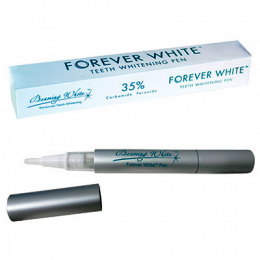 The Forever White™ Teeth Whitening Pen is a safe, effective and quick way to achieve bright, white teeth. The #1 teeth whitening pen in the industry, Forever White™ pens contain the strongest gel available for home use (35% Carbamide Peroxide), and are made in the USA.